When you think of Pizza, you think of Domino’s. It’s tasty, hot and delivered within 30 minutes. Domino’s Pizza is like comfort food, you can order whenever you want and serve it at any occasion. Hosting a house party? Order from Domino’s because everyone loves it. Too lazy to cook? Enjoy the wide variety of pizzas and sides from Domino’s that get delivered right at your doorstep. 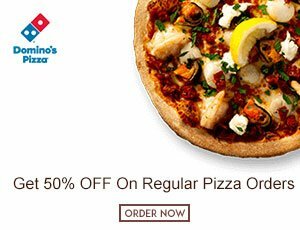 It’s time to order as you can now have a look at the marvelous menu from Domino’s and you can get great discounts using the promo codes from this website! 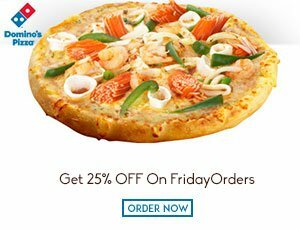 Domino’s is offering 25% discount on orders of Rs.400 and above. Enjoy your delicious pizza at a discount of 25%. Domino’s offering a wide variety of pizzas for both vegetarians and non-vegetarians gives an opportunity to customize the pizzas choosing the toppings of your choice. You may have to make an additional payment for every topping you add to the regular pizza. Order for Rs.400 and enjoy it at a price of Rs.300. 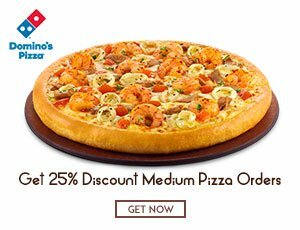 To avail the Domino’s 25 percent off offer, give the coupon code TEMP25 at the time of billing.If want more discount then you can order Domino’s pizza from foodpanda. With Foodpand Offers you can get additional discount on pizza order. The discount code has to be provided before the billing process to avail the discount. Celebrate the weekend getting two pizzas for the price of one. Order one pizza and get the other at absolutely zero cost on Friday. Give the Domino’s 1+1 coupon code MOB06 to avail the BOGO offer. You can find this type of offer in KFC also, but that is not for pizza. That belongs to chicken, So simply check KFC buy one get one offer avail that discount also. The Domino’s buy one get one offer is valid only on mobile and online orders. The second pizza should be the same size as that of the first or it should be a lesser value compared to the first. The offer is not valid on simple vegetarian pizza, simply non-vegetarian pizza, regular size pizza, combos, and beverages. This offer should not be used along with other offers. Use the coupon code appropriately to get the discount offer. The mouth-watering juicy cheese pizza is the favorite of all of the pizza varieties for the majority of pizza lovers. Order a cheesy wonder or a cheese burst pizza and get 50% discount on second pizza. The Domino’s 50 discount offer can be availed by giving the coupon code NET10. The offer is valid only on cheese burst pizza. The second pizza should also be a cheese burst pizza. The offer is not valid on other pizza variants. The second pizza should be the same size as the first one or lesser value than the first pizza. Do you wish to only order sides at Domino’s and get them delivered to your home? Go ahead and build your order worth Rs.350 and get a discount of 25%. You can choose from wide variety of sides such as pasta, bread, dips, beverages, cakes and others. Place the order and the yummy sides will be delivered to you in less than 30 minutes. However, the delivery time may vary depending on the traffic and the weather conditions. Like Domino’s, Swiggy also offering various deals on pizzas. So, simply check Swiggy Pizza Coupons and grab those discounts also. The offer can be availed very easily by just visiting the Domino’s website and placing the order. The offer gets activated automatically on orders worth Rs.350 without giving any coupon code. The order should include only side sand should be of minimum value Rs.350. The offer is valid only on online orders. So, choose to make the online payment without paying cash on delivery. Order two pizzas and get 50% off on second pizza. Visit the Domino’s web page or open the Domino’s mobile application. Give you location and area to find the Domino’s store near your location. From the exclusive menu select the pizza of your choice. Choose medium or large size pizzas. Give domino’s 50 off coupon code ADV07 at the time of making the payment. The offer gets activated and a discount of 50% will be applied to the second pizza. You can get Domino’s pizza from Zomato also, With Zomato Offers you can get more discount on pizza orders. It should be noted that the offer is valid only on online orders. 50% off can be obtained only on second pizza. No minimum order value is required to avail the offer. The second pizza should be of the same size as the first one or should be of lesser value than the first one. Order a pizza and get the second pizza at 50% discount. Have a happy family gathering ordering as many pizzas as you wish. The Dominos 50 discount offer can be availed by giving the coupon code ADV07. It should be noted that each customer can use the coupon code only once. So, provide the delivery details and the order details appropriately. If you’re searching for burgers then McDonal’s id the best destination for you. They giving discount deals on all types of burgers. To get those deals check McDonald’s Burger Discount Coupons and pay less on you’re order. Domino’s does not cancel the order or take responsibility for the errors made by the customer in using the coupon code. Order for Rs.400 or more and get a flat discount of Rs.101 off at Dominos. Build your order for Rs.400 or more at Dominos online or using the mobile app to avail the 101 offer. Give the coupon code ADV03 to avail the discount at the time of making the payment. For extra savings, you can make the payment using online payment gateway such as Mobikwik Wallet. It should be noted that this is an online offer and is not valid for in-restaurant orders. The offer cannot be used on simply veg and simply non-vegetarian combos and pizzas. The offer is valid only on 25th, 26th, and 27th December. The minimum bill value should be Rs.400.The Nearby store is an online store offering various products at very low prices. At nearby stores, you can get Dominos voucher worth Rs.500 at flat 50% discount for just Rs.249. Enjoy wide varieties of pizzas at very low price. And you can get more discounts on faasos, but in faasos there is no option for choosing another restaurants. You have to choose those food only. But, faasos offering huge discounts on every food order. Visit the nearby online web store. View the Dominos Rs.500 voucher page. Now click on the buy the voucher and give the Dominos promo code to get instant 50% discount. Make the payment and get the voucher emailed to you. The voucher has to be used only on online orders. For orders that are more than Rs.500 the balance amount has to be paid by cash upon delivery. The voucher is valid only once. Give the order details carefully. The voucher cannot be redeemed for cash. It is not possible to cancel the order after using the voucher. The minimum bill amount should be Rs.500 or more. Pros: You Can Get Tasty Pizzas With Discount Fares. Indians love to enjoy different varieties of food both traditional and continental foods. World-class pizza outlets have made their entry into the Indian market and are able to attract a great number of loyal customers. Dominos India offers to give an opportunity for Indian pizza lovers to get scrumptious pizzas and a wide variety of bread at a low price. Domino’s gives fresh deals on its foods every day. The domino’s deals for today and the respective coupons can be obtained from Domino’s web page. Currently, Dominos is offering 30% off on all pizza orders made during 3-7 P.M. The Domino’s pizza festival order online coupon code is DPF30. Just give the coupon code at checkout and you can get the discount on your order. With domino’s fresh deals you can make everyday a special day and spend time with your loved ones eating the soft cheesy pizzas. Get a flat discount of 20% on Monday at Dominos. The best part of Domino’s Monday offer is that you will get an extra saving of 30% that can be availed on your order. Visit the Dominos web page. Give your location and the area to find your nearest Domino’s store. Choose the foods of your choice and build the order. Give the Dominos coupon code NET07 to avail the 20% discount offer. Proceed to the payment. Your delicious foods will be delivered to you within 30 minutes. The extra saving 30% coupon to be availed on your next order will be emailed to you.The offer is valid only on Monday. The offer cannot be used on simply veg, simply N-veg pizzas, regular pizzas and combos and beverages. The extra saving 30% offer has to be used only from Tuesday to Sunday. Get a discount of 20% on your order of Rs.350 and above. Give the coupon code NET07 to avail the discount. Hurry up and avail this limited time Dominos Tuesday offer. Select a pizza of your choice from the available menu. Having special cravings then customize your pizza with toppings of your choice. You can choose from a long list of pizza toppings such as jalapenos, tomatoes, pepper, black olives and more. Avail this Dominos online offer and have fun with friends bidding adios to work stress. If your unable to order on online, then go to Domino’s store simply book Ola cab with discount price. While booking cab check Ola Cabs Tuesday Offer and save more on your’e trip. Get a flat discount of Rs.100 off on your order of Rs.400 or get a discount of 25% on your order of Rs.350. Select from the wide variety of pizzas that includes cheese pizza, non-veg, veg extravaganza, chicken pizza and more and make your order. Give the coupon code TMP25 to get the 25% discount and Dominos 100 Rs off coupon code WBZ to get the Rs.100 discount.The Dominos offer Wednesday cannot be used on orders that include simply veg, simply N-veg pizzas, regular pizzas and combos and sides. The offer is valid only on Wednesday. Only online users i.e. who use the online payment gateways can only avail the offer. Like Domino’s, KFC also offering special deals on Wednesday. To get those discounts check KFC Wednesday Coupons and enjoy the delicious chicken. Order the foods of your choice at Dominos on Wednesday’s and save 25% on your food bill of Rs.350 and above. The offer can be used on every Wednesday. TMP25 is the coupon code that has to be given to avail the offer. Dominos is offering a flat discount of 20% on food bill of Rs.350. To avail the Dominos Thursday offer order fresh pan pizza or other items and build your order for a price of Rs.350. The offer is valid for new and existing users. The promo code NET07 has to be given at the time of payment to activate the deal. The offer has to be used in single without combining with other offers. Now celebrate every Friday enjoying the juicy cheese bursts and pizzas with various toppings of your choice at dominos. Get a discount of 25% on orders of a minimum value of Rs.350. Make a food bill worth Rs.350 and you can get a side worth 25% of the bill amount free. Check here for Domino’s Friday coupon code and give it at the time of making the online order to get the discount.The offer is valid only on Friday. The Dominos offer for Friday is valid only on orders worth Rs.350 and more. While making the payment you can get cashback, So, before paying bill check whether there is any wallets are placed like Paytm, Mobikwik and Freecharge. Take delight of soft cheesy scrumptious pizzas at Dominos over the weekend by availing exciting Dominos offer Saturday. You can get a discount of Rs.100 off on Rs.400 and above with the exciting Saturday offer. 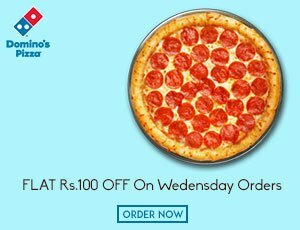 Give Domino’s 100 off coupon code WBZ100 to get the Rs.100 off on your food bill. It should be noted that the offer is valid only on Saturday. The minimum bill amounts to get a discount of Rs.100 is Rs.400. Both existing and new users can avail the offer. Order delicious Domino’s Cheesy wonder pizza or Cheesy burst from anywhere using the Domino’s mobile application. Domino’s mobile application can be downloaded from App Store, Google Play Store or the Windows Phone store. The application is available for free. The weekend is the time to have fun with family members and friends. 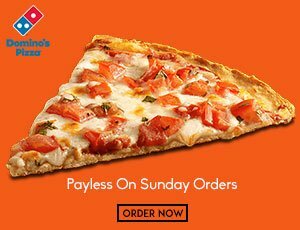 Make your Sundays more appetizing by ordering pizza or sides of your choice at Dominos. Build your order for Rs.350 and get a free garlic bread and dip. Visit the Domino’s website. Identify Domino’s store near to your location. Include pizzas, sides, beverages or combos of your choice in your basket. Make the final bill amount to Rs.350. Give the coupon code NET09 and make the bill payment. The Dominos Sunday offer gets activated and your free garlic bread will be included in the order. Order now at Dominos and enjoy the mouth-watering garlic bread. Enjoy the weekend with family and friends ordering freshly baked pan pizza from Dominos at a discount of Rs.100. Dominos is offering a discount of Rs.100 on all online orders worth Rs.400 and more. Visit the Dominos webpage. Give your city and area to which the delivery has to be made. From the menu choose the bread and pizzas of your choice. Give the Dominos weekend coupons code WBZ100 to get Rs.100 off and place the order. Payment can be made using the credit or debit card. You can also pay cash on delivery.The Dominos 100 off offer is valid only on all varieties of pizzas and bread. The discount of Rs.100 is given only on weekend – Friday, Saturday, and Sunday. Like Domino’s, Uber Cabs also giving special discounts on Weekends, but not on pizzas they are giving discount on cab rides. To grab those discounts check Uber Cabs Weekend Ride Promo Codes and save more on your’e trip. Pros: You Can Get Pizza With in 30 Minutes After Placing Order. Dominos India offers can be availed very easily by giving Dominos India coupons at the time of making the payment. A different set of Dominos deals is offered for customers visiting the restaurant and those ordering the food online from Dominos website. Enjoy the Pizza Mania combos at Domino’s for a surprisingly low price. The combos include veg singles, veg doubles, non-veg doubles, mixed doubles and non-veg singles. You can customize the combo with toppings of your choice such as onion and capsicum, jalapeno and pineapple, tomato and corn, tomato and pineapple, onion and paneer and more. So, make the order and enjoy the delicious combos with your loved one. You can get combo offers every day in faasos. They are offering different variate on every deal. Dominos 4 pizza combo offer price is very low compared to other pizza outlet chains in India. The four pizza combos can be of double toppings or single toppings. The double topping pizza price is just Rs.49. Double topping veg pizzas include onion and capsicum, tomato and golden corn, Jalapeno and Pineapple and Paneer and onion. The four single topping pizzas include onion, golden corn, and capsicum and tomato pizzas. Order your favorite single topping pizza combo online and grab exciting Dominos 4 pizza deals. Dominos is known for offering different varieties of pizzas to suit the tastes of its customers. It is not just the pizza varieties Domino’s is also popular for offering surprising deals for its customers. Get flat 30% discount on your pizza order of worth Rs.350.Choose the pizza crust of your choice and order a customized pizza by choosing toppings of your choice. At Domino’s, both vegetarians and non-vegetarians can find a wide variety of toppings. Now, place the order. Pay Rs.1 using the online payment system. The voucher with a Crazeal code will be emailed to you. Give the Crazeal code at the promo code during the payment to avail the flat 30% discount. The offer is valid on online orders. The minimum food bill should of Rs.350. The offer can be used on simply veg, combos, simply non-veg pizzas, beverages, and desserts. Coupon code has to be provided to get the discount. One voucher can be obtained per bill. Domino’s provides delivery on orders. However, if Domino’s does not provide delivery services to your area then you have to collect the order at the store. Get this exciting Dominos pizza offer of Rs.100 off on orders of Rs.500 and above. From the huge varieties of sides, pizzas choose the foods of your choice and build your order for Rs.500 and get a flat discount of Rs.100 off on Rs.500. Visit the Domino’s website. Find the restaurant near your location by giving the city and area of residence. From the available list of food items choose the foods of your choice. You can find these type of deals in Swiggy also, they also offering special offers on selected restaurants. To get those discounts check Swiggy Offers on Selected Restaurants and save more on delicious food. However, make sure not to choose beverages, combos, and desserts. Build your order for Rs.500. The discount offer gets activated and you will be charged only Rs.400 for a bill of Rs.500. The discount offer is valid only on online orders. Extra taxes as applicable have to be paid. The offer is not valid on simply vegetarian, simply non-vegetarian, desserts, combos, and beverages. The minimum bill amount should be Rs.500 and above. The Maximum amount of discount that can be obtained is Rs.100. Dominos is offering one pizza free when you buy a medium or large size pizza. Give the Dominos 1 pizza free coupon code MOBO6 to get your free pizza. You can even get 25% cashback by choosing to pay with any of the online payment methods such as credit/debit card, Paytm wallet, and PayUMoney or Mobikwik wallet. The offer is valid only on medium and large size pizzas. Maximum cashback that can be obtained with Mobikwik is Rs.100. Maximum cashback that can be obtained with PayUMoney is 10% of up to Rs.50. The maximum cashback with PayTm is 10% of up to Rs.25. The offer is valid on mobile, online and in-store ordering. One pizza free offer is not valid on regular size pizza, veg/non-veg pizzas and Pizza mania combos. Due to huge demand, thirty minutes of delivery is not valid for this offer. 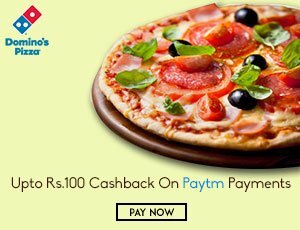 Get flat 10% discount at dominos by making an online payment using Paytm wallet. Using the offer is very simple. Visit the Dominos page, give the delivery address details, choose the food of your choice and place the order. At the time of making the payment choose an online payment option and pay using your Paytm wallet. A discount of 10% will be applied to your food bill. No coupon code is required.The discount is applicable only on payments made using Paytm wallet. The minimum order value should be Rs.100. Maximum cashback amount is limited to Rs.25. The cashback amount will be credited to your Paytm account within 72 hours of processing the order. Making payment with online gateways such as Mobikwik is safe and simple. 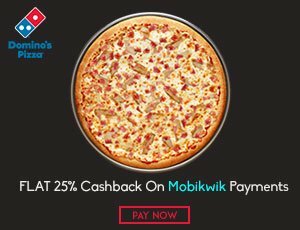 Order at Dominos and pay with your Mobikwik wallet to grab 25% cashback on your bill. To avail the offer give the coupon code MOBIDOM before making the payment. The offer gets activated. Make the payment and your hot pan pizza will be delivered to your doorsteps in a short time. The cashback amount will be credited to your account within 24 hours of processing the order. The offer is valid only on online orders. The maximum amount of cashback that can be obtained is Rs.100. Each user can use the coupon code for two times.Give the coupon code appropriately as Dominos does not take responsibility of user negligence in providing the order details or the coupon code. Pros: You Can Get Cashbacks On Multiple Payments. Few offers are provided in collaboration with payment gateways such as banks and Credit & Debit Cards. Shop using your HDFC credit card and earn as many reward points as you can and redeem them at Dominos to free pizza vouchers. Earn 1650 reward points and get a free pizza voucher of Rs.500. To obtain the free voucher use the coupon code GV22. The voucher can be redeemed only at selected Dominos restaurants and cities. Review your order details before placing the order. The Dominos offer code can be used only once. The coupon code once used cannot be canceled. Dominos is not responsible for the lost points if the customer uses the code inappropriately. Dominos is offering a discount of 20% on orders of Rs.350 and above for its HDFC customers. Visit the Dominos online ordering site and choose the foods of your choice from the menu. Make the order for Rs.350. choose the online payment option and make the payment using HDFC credit/debit card to avail the 20% discount. So, if you are ordering for Rs.399 you will be paying the only Rs.259. Celebrate this Dominos Rishton Ka Time with friends and strengthen your relationship. The offer is valid only for HDFC credit/debit card users. The minimum order value should be Rs. 350. 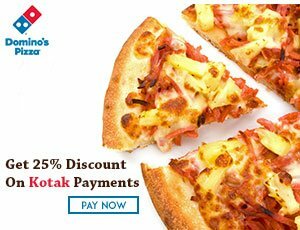 Kotak Bank customers can get a 25% discount on orders of Rs.350 and above at Dominos. This is an in-restaurant offer and the customer is required to provide the coupon code ALO53 at the time of billing at the restaurant to avail the discount offer. Visit your nearest Domino’s restaurant, make your order, enjoy the delicious and meal and do not forget to provide the Dominos discount coupon code before your food bill is processed. Make the payment using your Kotak bank credit or debit card to avail the offer. The offer is not valid on online orders. The coupon code has to be provided before the bill is processed at the counter. With the offer Pizzas and bread can only be obtained for discounted price. The offer is not valid on beverage products, simply non-veg and simply veg pizzas, and garlic bread sticks. Only Kotak bank users can avail the offer. Customers love to taste new foods and they would be more interested if they are being offered exciting deals. To tap in more customers, Domino’s introduces exciting deals on its various dishes on special occasions and on specific weekdays. Whenever it introduces a new food item it offers it at discounted price or for free along with other orders. It also offers gift vouchers that can be gifted to friends and family members giving them the opportunity to taste the delicious Domino’s foods. Physical and electronic vouchers are available at Dominos. Check for Dominos deals for today at Domino’s website and avail them by providing the promo code listed at the restaurant site. Dominos is delivering delicious pizzas to a great number of its customers via Foodpanda. By partnering with Foodpanda, Dominos is able to serve a number of customers. Get 20% off with Domino’s Foodpanda offer. Select the pizza of your choice and make your order online at Foodpanda website. Visit the Foodpanda website. Give your city and area to find the list of Dominos restaurants in your location. Visit the Dominos Foodpanda webpage, choose the foods of your choice from the exclusive menu and make the order. Choose to make the online payment to get the 20% discount. The offer is valid only on online orders. Maximum discount that be obtained is 20%. The order has to be made at Foodpanda website. Have a good time with friends or family members enjoying delicious foods from Dominos. Grab the Dominos hot deals and order more for a lesser price. Order for Rs.350 and get a flat discount of 15% on your order. 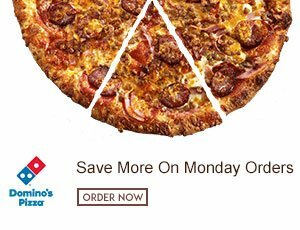 Give the Dominos coupon online code to get the 15% discount on your order. The offer is not valid on regular pizzas, simply vegetarian, simply non-vegetarian pizzas and combos. The offer is valid only on online orders. Domino’s has introduced the new subwich for a low price of just Rs.45. You can even enjoy a coke having the subwich for the price of Rs.45. Dominos is offering this delicious subwich absolutely free if you order at Dominos for Rs.350. Make the order of Rs.350 and do not forget to ask your free subwich. Visit the Dominos web page or use the Domino’s mobile application. Give your area and the city to find your nearest Domino’s store. Choose pizzas, bread, or beverages and make an order of Rs.350. Give the coupon code NET19 to get a free Subwich. Make the payment. The new introduced subwich worth Rs.45 would be yours for free. Try the new Subwich for free and start enjoying your lunch breaks. Domino’s established by Tom Monaghan and James Monaghan in the Year 1960 in Michigan, United States has its franchise stores in 70 countries across the globe. Dominos India first store was started in the year 1996 in partnership with Jubilant FoodWorks. IT offers a wide range of pizzas, sides, beverages and other dishes. The amazing kid’s meal attracts kids and the surprising toy within the box makes the meal memorable for kids. The juicy and crispy pizzas make you crave for more. You can enjoy the delicious Domino’s foods at a restaurant or get them delivered to your doorsteps. Online orders can be made at the Domino’s web page or by using the Domino’s mobile application. Dominos India online ordering is simple and easy to use. All food orders are delivered within 30 minutes except for the combos. Payment for online orders can be made using various payment gateways. An additional cashback of up to 25% can be obtained using the payment gateways. Dominos deals on pizzas and sides let you save big on your order. Few deals offer up to 50% discount or a cashback of Rs.100 on your order. Use Dominos coupons and give the discount coupon code at the time of payment and avail the discount on your order. Domino’s was established in the year 1960 in the United States by Tom Monaghan and James Monaghan. Since its establishment, the company has expanded its operations across the United States and has also entered the international market. It currently operates in 70 countries with about 10,000 franchise stores. Domino’s is the second largest pizza delivery chain operating in the United States. The company has its headquarters in Michigan, United States of America. Domino’s Pizza entered the Indian market in the year 1996. Domino’s franchise stores in India are owned by Jubilant FoodWorks Limited. It has been serving Indian market offering delicious high-quality pizzas, beverages, and sides. All of its products are worth the price being charged. Domino’s makes itself different from other delivery chains in India by delivering hot pizzas in just 30 minutes. It challenges to deliver all orders with less than four pizzas within thirty minutes or else it promises to give free pizza vouchers to the customers. Dominos India online order system efficiently handles all the orders and delivers them promptly within 30 minutes. To make pizza ordering more comfortable and easy to its loyal customers, Domino’s has designed mobile application. Using the mobile application, customers can place the order from their mobile from anywhere. Just give the delivery address, place the order, make the payment and rest will be taken care. Domino’s offers various payment methods for the comfort of its customers. Payments can be made using debit or credit cards or using payment gateways such as PayUMoney, Paytm, and Mobikwik. What is Domino’s Special Menu? Domino’s designs its menu to match the local demand. Initially, Domino’s served only pizzas and later included a variety of dishes. Its menu includes a range of bread, pasta, pizzas, oven-baked sandwiches, breadsticks, desserts such as cakes and beverages. Pizzas are made with different crust types and variety of toppings. Customers can customize their pizzas by choosing the toppings of their choice. Dominos that initially entered the market with pizzas expanded the menu gradually including a variety of sides, beverages, and bread. Its menu currently includes a wide range of pizzas with different crusts and toppings that include both vegetarian and non-vegetarian, Italian pasta, sides such as breadsticks, stuffed garlic bread, cheese dip, lava cake, chicken wings, calzone pockets, and cheese jalapeno dip. It also offers pizza combos with four pizzas with single or double toppings. Customers can customize the pizza choosing the crust and the toppings of their choice. The sauces it uses are also designed to best suit the local tastes.